Electronics have come a long way, especially home appliances, like TVs, refrigerators, microwave ovens, etc. But the humble doorbell has had the same design for over a very long time. 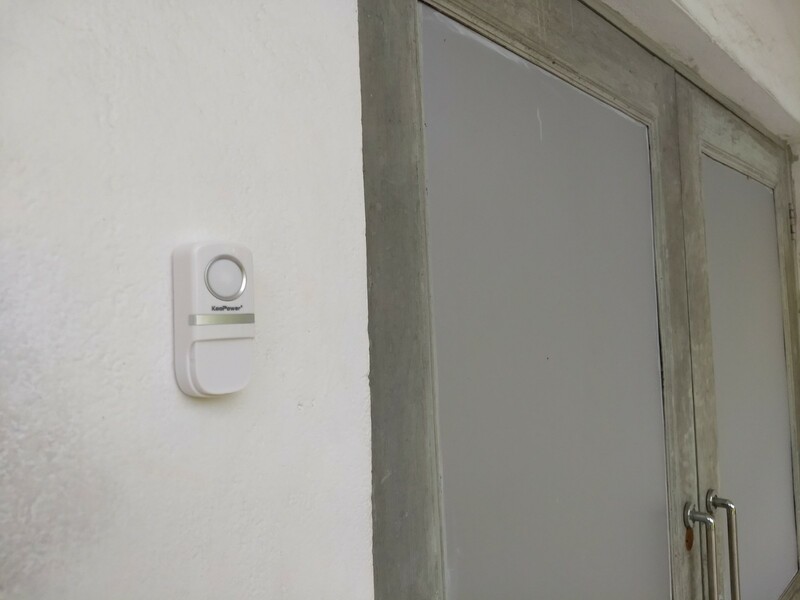 Some doorbells got additional features like on-demand voice and CCTV interaction with the visitor, but the core electrical design remained the same. Wireless doorbells, however, changed this design as the doorbell switch can no longer be a part of the electrical circuit. 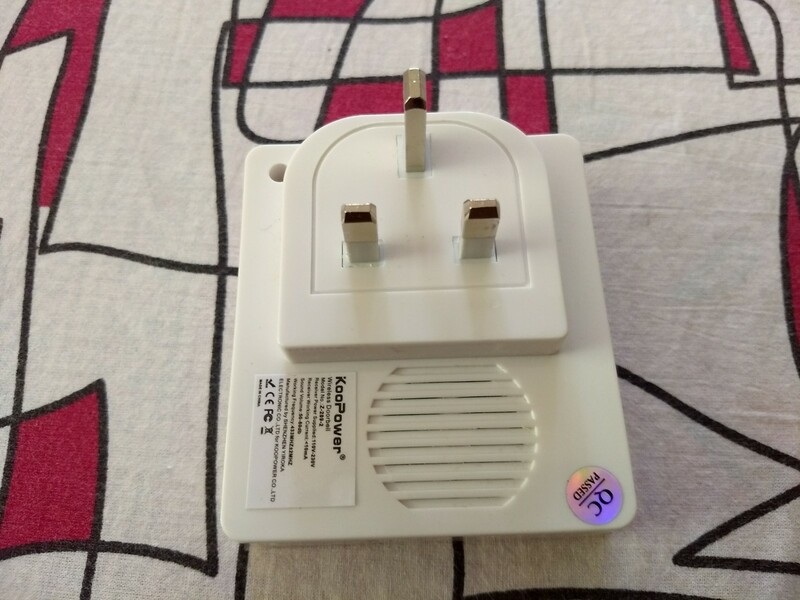 The switch is now a battery-powered transmitter that sends a signal pulse over RF (radio-frequency) or IR (infra-red) spectrum which is received by the bell powered by another battery or AC power mains. 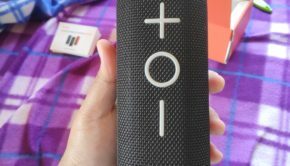 However, KooPower has taken the design one step further by making the switch battery-less. 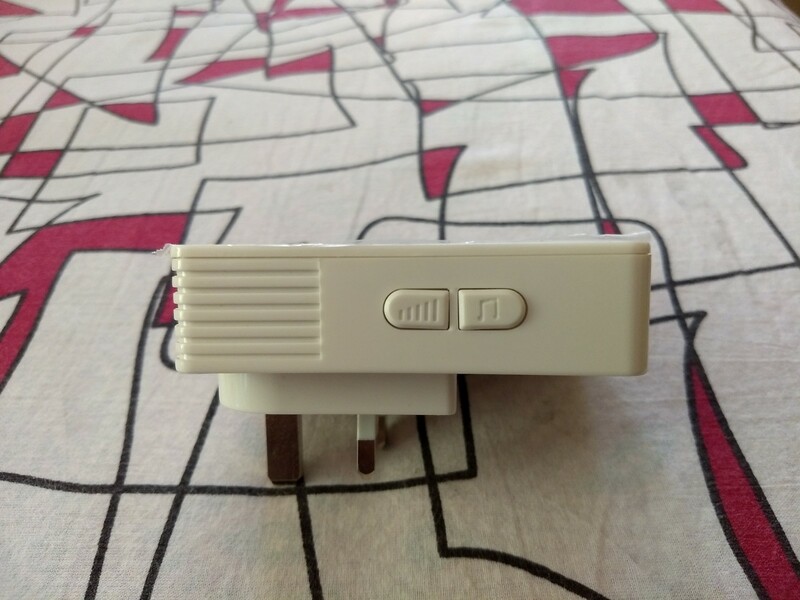 The switch is now powered using a tiny piezoelectric generator (similar to push-button gas lighters). This generator converts the mechanical energy of a person pressing the switch button to electrical energy to power the RF transmitter in order to send the pulse. 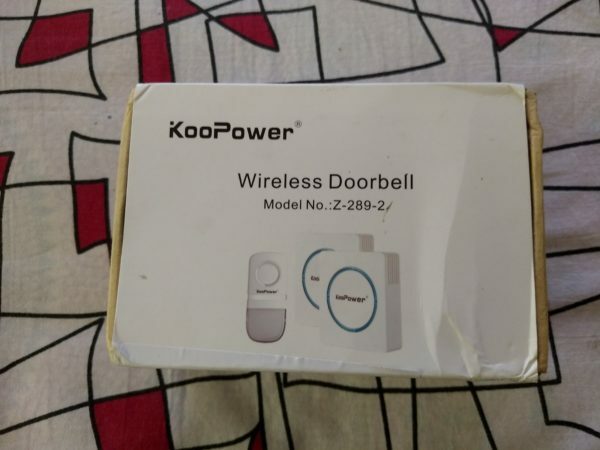 In other words, while wireless doorbells have given us the convenience of not needing add writing to install them, KooPower’s version of the wireless doorbell takes this convenience ahead by not requiring to buy, insert or replace batteries for the doorbell switch. 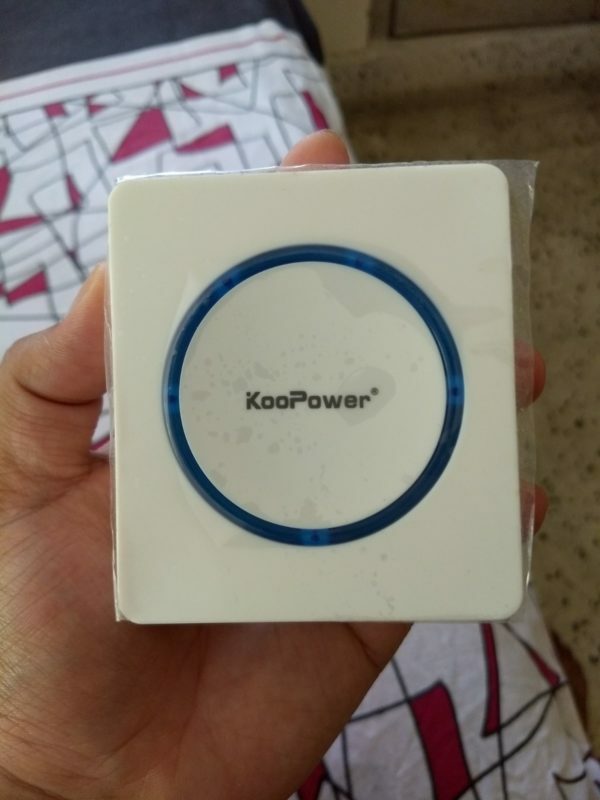 KooPower has sent us one unit for review. We thank them heartily for choosing Techno FAQ and our readers for this opportunity. 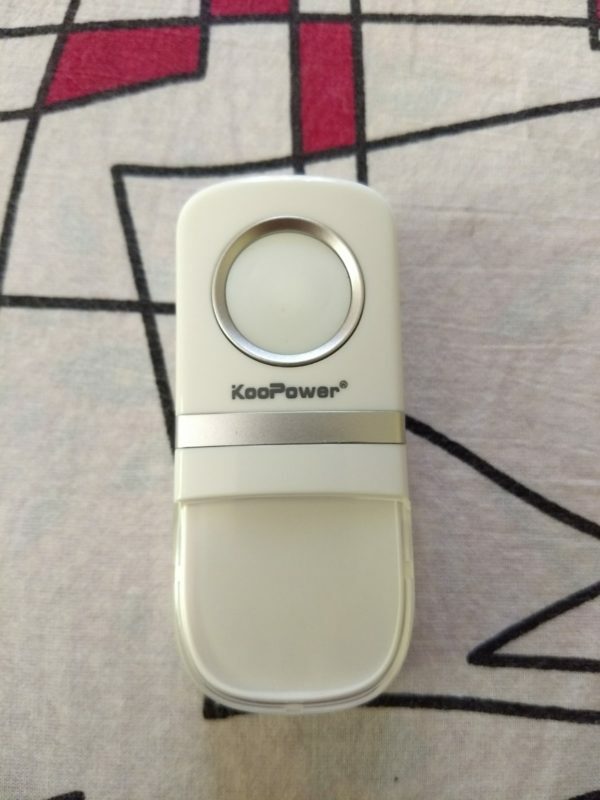 Today, we will unbox, install, test and demonstrate the KooPower Battery-Free Wireless Doorbell and tell you what we think about the product. So read on to know more. 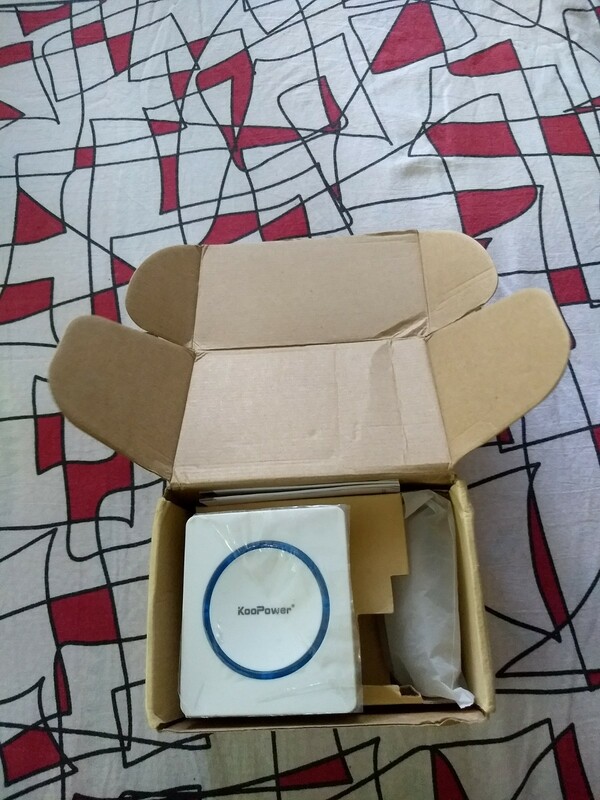 The KooPower Battery-Free Wireless Doorbell Kit comes in a small light-brown coloured box with a white sleeve having printed illustrations. Sliding away the sleeve and opening the box, we are greeted with a chime (bell) and am item covered in plastic. Taking out the doorbell, and opening up the box partition, we see there is another chime, the doorbell switch wrapped in a plastic pouch, a user manual, a double sided tape and mounting screws. The following picture shows the contents of the box after unpacking. Now let us have a closer look at a chime (bell). The front side has a circular LED strip. The side of the chime has two keys: one to change the ring volume (loudness) and other to change the ring tune. The back side of the chime has the power plug and the speaker. Let us look at the switch module now. All it has is a button that with a strong click (tactile response) and a body housing the transmitter. 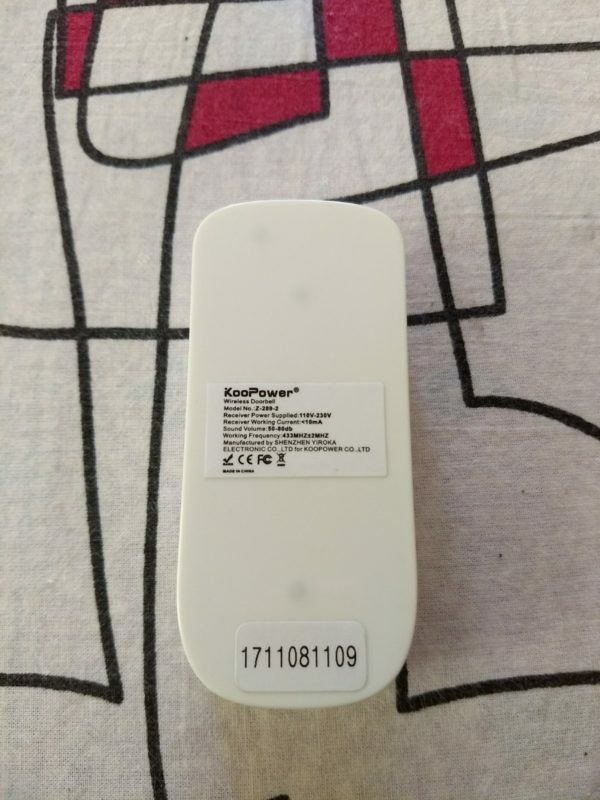 The back side of the switch module has a paper sticker with regulatory information on it. Now that we have unboxed the unit, let’s move on to using it. 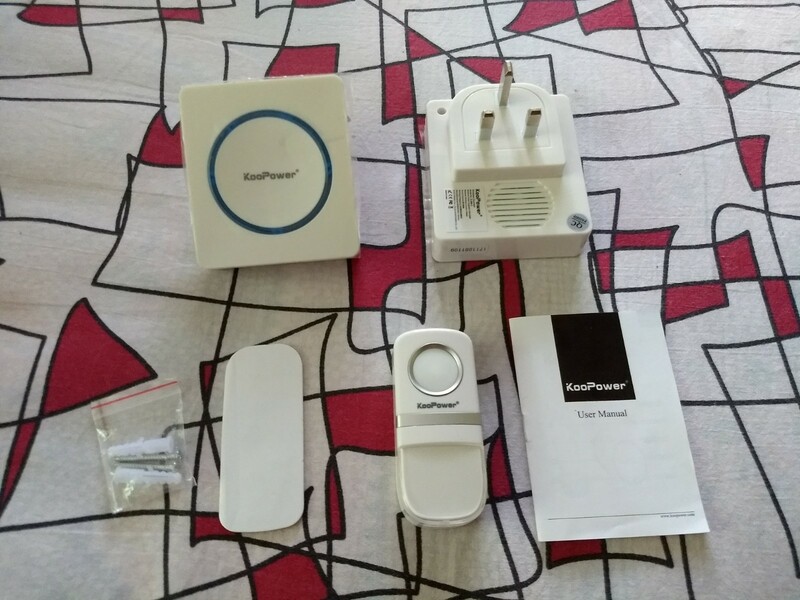 Installing the KooPower Battery-Free Wireless Doorbell is very easy. All you need to do is connect each of the chimes (or bells) to a power socket in different rooms. After that we need to take out the switch module and click the button to see if the chimes respond by ringing. Take the switch close to each chime and press the button to find that out. By default, the switch and the chimes are paired to each other out of the box. So, I did not have to do anything extra. Pressing the switch button rings the bells. See the below video for the demonstration. The manual also suggests that, in many cases, the transmitter in the switch and the receiver in the bells may not be paired. Or you may wish to buy an extra switch for another door to use. 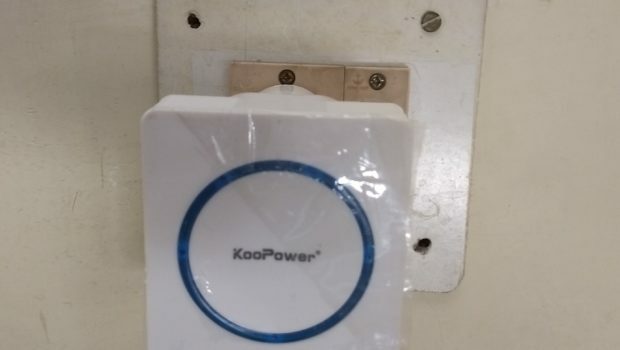 In that case, KooPower has a video on how to pair a new switch to the chime. Once you have tested and ascertained that the switch is working as expected, you can finally mount it next to your door. For that you can take off the film of one side of the double sided tape and stick it to the switch module’s body. After that, take out the film from the other side of the tape and firmly stick the switch to the wall adjacent to the door. A mounted switch looks like this. At this point, a visitor wishing to meet you can press the button and both the chimes will ring and alert you. Now, coming back to each chime, there are two buttons. One for setting the loudness and the other for setting the tune. Here is a video demonstration by us on how to change the loudness. Here is another video that shows how to change the tune and all the available tunes that can be set on the chime. We found the product to be of very high quality. The bodies of both the chimes and the switch module are made of strong plastic do not break when dropped or disassembled. Secondly, the loudness of the chimes can be set to very low or very high depending on what you choose. 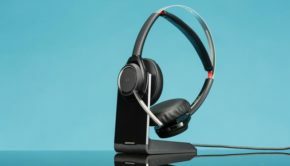 At its highest volume, it is very loud and is audible in the face of most background noise, including those of mixer-grinders and electric drills, something which most bells do not do. There is also visual feedback with a flashing LED. I have missed appointments of countless people who ring, wait by the door and leave, just because I was using a grinder. With these bells, this is not longer an issue. Thirdly, there are a huge selection of tunes including evergreen classics and seasonal tunes. So there is always the option of setting a custom tune per door, per chime or even according to then ongoing festival. 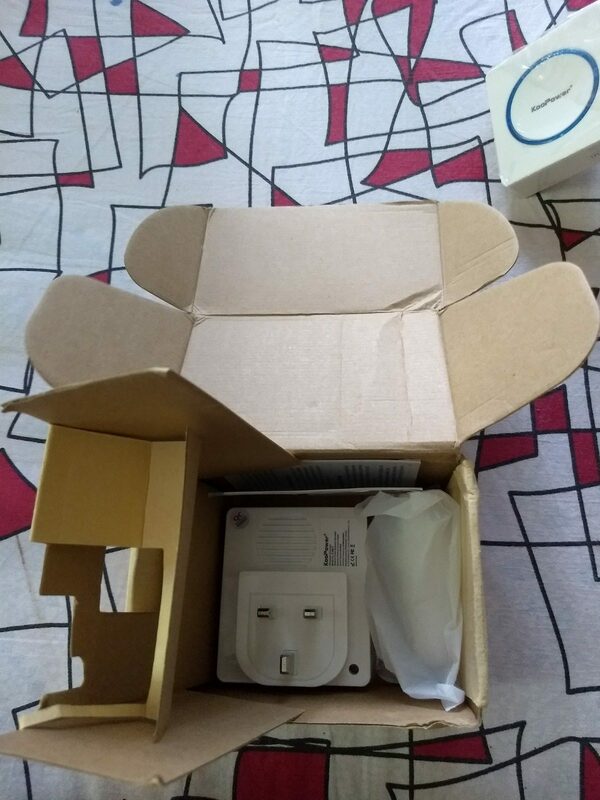 Lastly, but most importantly, the greatest advantage with this doorbell kit is that I do not need to insert batteries into the switch to make it work. It uses the energy of the push on the button when pressed to send the ring signal to the chimes. This feature relieves me of the responsibility of replacing batteries every few months. In other words, it is a (fit and forget)™ solution and (just works)™. 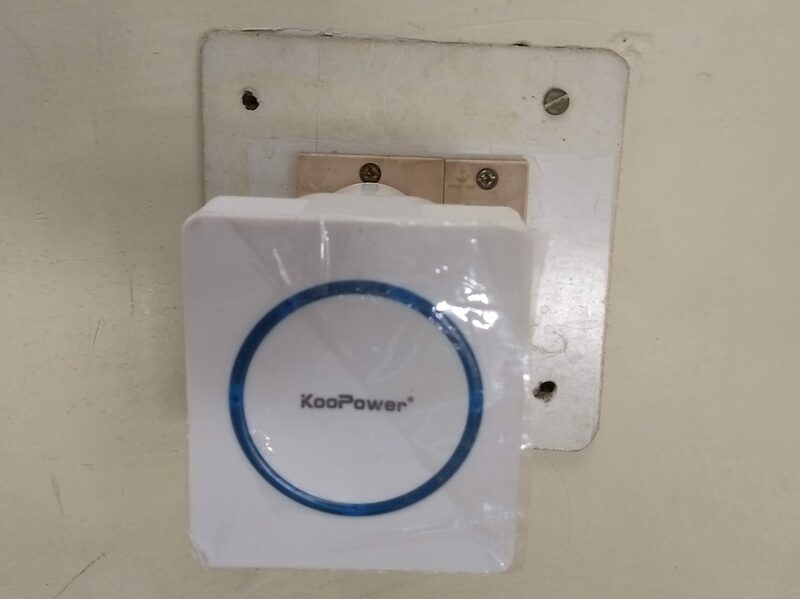 The KooPower Battery-Free Wireless Doorbell has been installed at my home for a few days now and and like a true (fit and forget)™ I have not faced any problems yet. Loudness setting has a very wide range. Offers a wide choice of ringing tunes. Transmitter and receiver in the same box are pre-paired and needs no manual intervention. Doorbell switch does not need batteries. The KooPower Battery-Free Wireless Doorbell can be purchased on KooPower online store for $30.97 and on Amazon UK for £21.99. 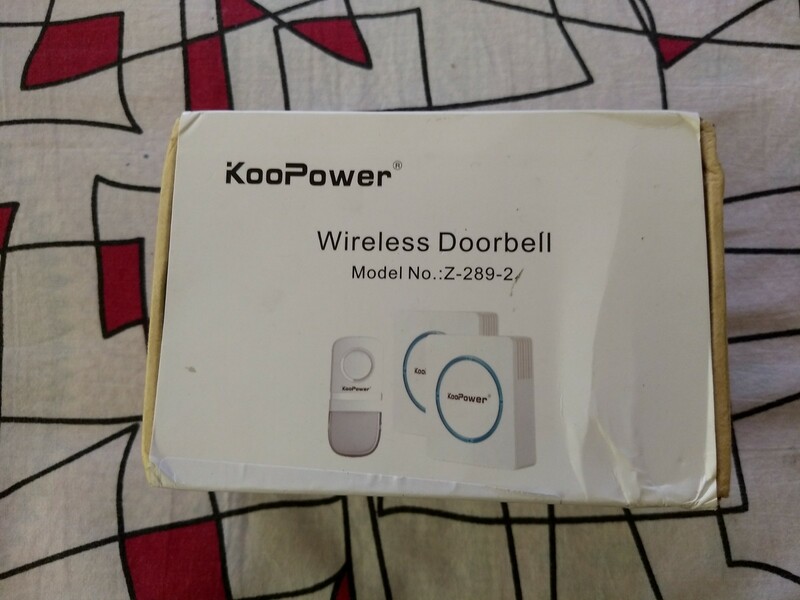 Its not cheap compared to traditional doorbells but the no-battery wireless switch more than justifies the price tag. 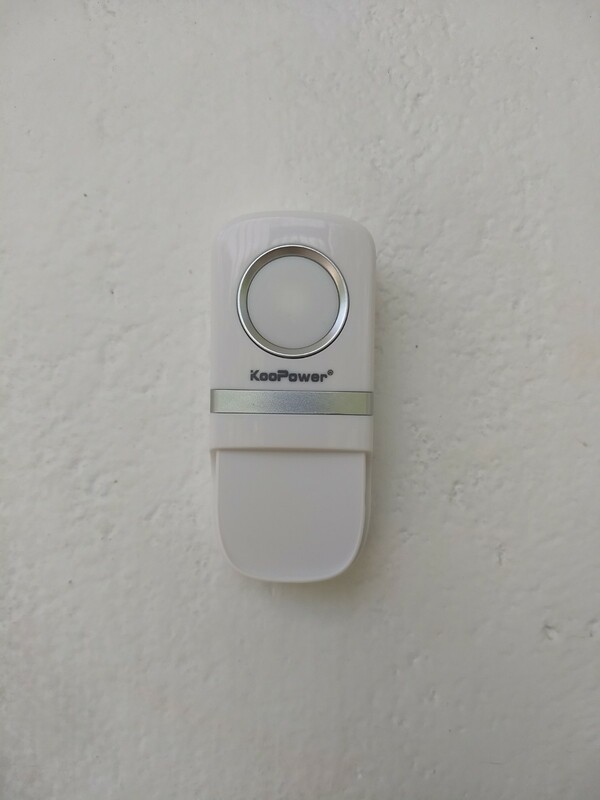 The KooPower Battery-Free Wireless Doorbell is very easy to install and use. It also relieves you of the job of replacing batteries on the switch like a fit and forget solution. The sound is also louder than a regular doorbell. All in all, if you cannot install wiring to deploy a traditional doorbell or are not satisfied with your existing doorbell, then you can go ahead and acquire this product without any hesitation.